Unorthodox-Jew A Critical View of Orthodox Judaism: "Sexual Abuse, Shonda and Concealment in Orthodox Jewish Communities is a call to all charged with protecting children from abuse to refuse to appease powerful rabbis who try to prevent child sexual abuse cases from being reported and investigated." "Sexual Abuse, Shonda and Concealment in Orthodox Jewish Communities is a call to all charged with protecting children from abuse to refuse to appease powerful rabbis who try to prevent child sexual abuse cases from being reported and investigated." "Michael Lesher is a radical, a rebel, a hero. He has stood up against an unjust system by speaking terrible truths, and with these truths he might just manage to shatter one of the modern-day religious fundamentalist forms of oppression in our midst." --Christopher Ketcham, contributing editor, Harper's, whose work has appeared in Vanity Fair, GQ, The Nation, Mother Jones, and many other magazines. This book--the first of its kind--analyzes how and why cases of child sexual abuse have been systematically concealed in Orthodox Jewish communities. The book examines many such cover-ups in detail, showing how denial, backlash against victims, and the manipulation of the secular justice system have placed Orthodox Jewish community leaders in the position of defending or even enabling child abusers. The book also examines the generally disappointing treatment of this issue in popular media, while dissecting the institutions that contribute to the cover-ups, including two--rabbinic courts and local Orthodox "patrols"--that are more or less unique to Orthodox Jewish communities. Finally, the book explores the cultural factors that have contributed to this tragedy, and concludes with hopes and proposals for future reform. 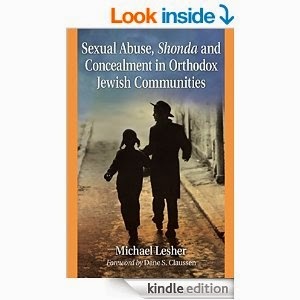 "Michael Lesher has written an exhaustively researched analysis of why the Orthodox Jewish community, as a whole, goes to great and damaging lengths to cover up sexual abuse of its children. Perhaps the most valuable aspect of Lesher's book is his cogent analysis of the interplay of a complex set of Orthodox norms and values. He maps out their historical and psychological underpinnings, sketching a clear picture of how the community's growing obsession with women's modesty and children's purity is deeply tied to its emphasis on authority and the suppression of sexuality. With deep appreciation for the nuances of Orthodox culture, he explains why anyone who threatens this carefully constructed fortress of fear is expelled, with the result, all too often, of re-victimizing the people who were abused in the first place." --Debra Nussbaum Cohen, contributing editor for The Forward, and New York correspondent for Ha'aretz. "Sexual Abuse, Shonda and Concealment in Orthodox Jewish Communities is a call to the media, politicians, and governmental agencies charged with protecting children from abuse to refuse to appease powerful rabbis who try to prevent child sexual abuse cases from being reported and investigated. The book serves as a wakeup call to mainstream Jewish leaders and congregants to demand that more conservative and authoritarian branches do more to protect the youngest and most vulnerable members." --Janet Heimlich, author of Breaking Their Will: Shedding Light on Religious Child Maltreatment and founder of the Child-Friendly Faith Project. "I'm proud to include Michael Lesher in my circle of friends. He has consistently been an outstanding voice of reason in a cruel society that puts child-rapists interests ahead of the interests of victimized children. Long before it became "fashionable" to be a victims' advocate, his law practice represented victims of abuse at little or no cost. His trailblazing investigation of the Rabbi Avrohom Mondrowitz case, tracked his footsteps to Israel, the D.A. 's alleged involvement with the New York rabbis, intentionally waiting until Mondrowitz escaped the U.S. in the middle of the night to Israel to commence an investigation, and attempting in every legal venue available to him to get Mondrowitz extradited back to the U.S. for prosecution. His tenacity in pursuing sexual predators in the Jewish community, served as a model to me in my dogged pursuit of Jewish and gentile child-rapists, and the Jewish establishment and rabbis that maliciously covered up their crimes, destroying an untold number of young lives. If you buy one book this year, whether you are a member of the Jewish faith or not, this compelling book will force you to finish it in one sitting." Michael Lesher, a writer and a lawyer, has published a number of articles about child abuse and is co-author of a book on the American family court system's poor record of protecting children. An Orthodox Jew, he has also published short fiction and poetry and lives in Passaic, New Jersey.